The Mouse Guard roleplaying game is based on a comic book series of the same name by David Peterson. The basic premise is mice with human level intelligence trying to protect their fragile civilization from all that threatens it. These threats include weasels, cats, foxes, and the spring rain. The comics have received favorable reviews from all quarters, and come highly recommended. I have never read them. Not because I don’t want to, but because I just haven’t found the time or money. I say this so you may that understand my feelings on the roleplaying game comes purely from that angle. I have no existing love of the setting that could possibly prop up a weak system. That said, I love this game. I’ve been a Luke Crane junkie ever since I discovered Burning Wheel, and not even having my heart broken by Burning Empires can change that. For a long time, I’d pretty much accepted that Burning Wheel would always be my favorite roleplaying game, but now that’s coming into question. Mouse Guard is everything I want in a game. It has good setting material, great mechanics, and a core die mechanic I’m more than a little fond of. I love playing this game, and so will you. Reading through the rule book feels like looking at a well designed race car. There is nothing there that doesn’t need to be. All the inessentials have been removed, and everything that’s left is focused on telling a great story in the way only roleplaying games can. Here are just a few examples. There are no powergaming combos. You know what I’m talking about. That series of feats you can take that causes a chain reaction to destroy the Death Star. That doesn’t exist in this game. If you want to be good at fighting, you put ranks in the Fighter skill. If you want to be good at persuasion, you take the Persuader skill. This is really valuable for new players; it means they can spend their time actually playing instead of trying to defeat the character generation beast. It’s also good for experienced players; it cuts down all the tiresome rivalry around the table about who can take the more powerful chain of abilities. The mechanics tell a story. Like previous Luke Crane games, Mouse Guard has players record what their character believe in, and what lessons life has taught them. This time, it’s down to its bare essentials: a belief encompasses the character’s outlook on life, an instinct that details their code of behavior, and a goal which states what they want to get done right now. Together, these pieces of information inform who the character is, not just what they can do. Much of the drama arises from playing both to and against them. I’ve run entire sessions based on nothing but the trouble characters got into for following their beliefs. The conflict resolution system is superb. 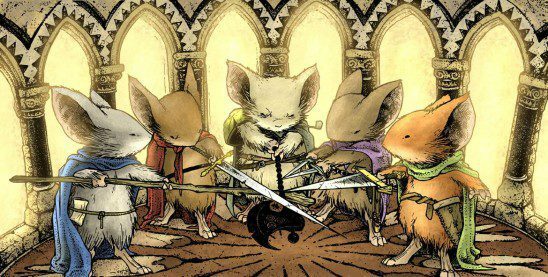 Burning Wheel gave us the Duel of Wits, and Mouse Guard takes it a step further. Any conflict, from a one on one deathmatch, to a political debate, to a high speed chase can be conducted using these rules. Just pick two or three skills that are relevant to the conflict and have at it. If you want a big part of your game to be the PCs putting out a brush fire, you can make that a conflict using, say, Pathfinder, Scout, and Fire-wise. These conflicts last just long enough to be satisfying, and are much more engaging than the “I shoot him, and then he shoots me” that permeates so many other combat systems out there. You can play the character you want to play. This might be the most revolutionary thing about Mouse Guard. There’s no expectation that everyone plays characters of the same power level. In fact, the game is predicated on the idea that some characters will be more experienced than others. It’s just as much fun to play the young tenderpaw as the grizzled old patrol leader. Because the game is so story driven, there isn’t the same need for everyone to be on the same plane in what their characters can do. It’s a game where you can roll up an inexperienced farm boy and not feel insignificant in the face of another player’s veteran swordsman. Burning Wheel, great as it may be, is a pretty standard system when it comes to narrative structure. The GM runs players through a session based only on their own best guess at pacing and flow. Story points happen when the GM thinks they should happen. Another Luke Crane game, Burning Empires, is an entirely different animal. This game has a highly structured format the GM must conform to when constructing scenes and placing them into a session. There are rules on how many statted out NPCs can exist at one time. Everything the GM does is subject to as many or more rules as the player’s actions. The idea in Burning Empires is a good one, but it can be hard to manage in play. Believe me, I’ve tried. Four times. Mouse Guard, on the other hand, strikes a perfect balance. The narrative mechanics are just sturdy enough to give the GM something to rest on, but not so constraining that it limits what they can do. I can’t say if the goal in writing Mouse Guard was to strike a balance between these existing games, but if so, mission accomplished. If not, then well done anyway. It’s always great to see game designers realize what worked and what didn’t work, then improve their games as a result. I mean that in only the best way. Put simply, running a game is hard. It takes a lot out of the game master, and often requires hours of prep time before hand. There’s a lot of leg work and detailed planning that must be taken care of in addition to crafting a good story. I tend to get painful headaches from spending long sessions making sure everything is exactly right. Mouse Guard fixes most of that. While no system can run a game for you, this one takes care of a lot of the nitty-gritty that it’s so easy to get stuck in. 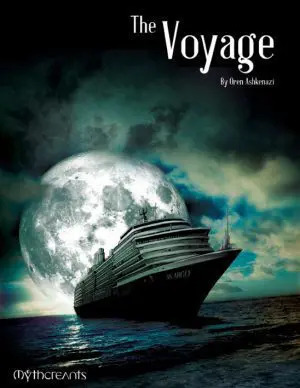 Never before have I found it so easy to design fun adventures for my group to play through every week, and I rarely have to plan for more than an hour. The game accomplishes this by paring the session down to what’s really important. At the most basic level, each adventure is a series of obstacles punctuated by a full blown conflict to spice things up. Mouse Guard makes it really easy to construct that base level, leaving the GM free to lay a good layer of story and drama on top of it. If a game is slowing down or getting stale, the conflict and belief mechanics offer plenty of spontaneous ways to make things interesting again. The GM searching for inspiration need only glance at the Patrol Leader’s goal saying “I must keep the tenderpaw safe” and they know that a sudden snake attack threatening said tenderpaw will suddenly get all the players involved again. Essentially, Mouse Guard lets GMs focus on what’s really important to their game. Their heads don’t have to be filled with precisely balancing an encounter or making sure everyone gets exactly their allotted share of loot. That isn’t really what makes a game fun. At the same time, it’s more than just the GM setting down and telling a story to the table. Players shape the story too, through the use of their skills in service to beliefs, instincts, and goals. No system is perfect, and I have noticed a handful of flaws with Mouse Guard, much as I might wish not to. Fortunately, most are fairly simple to solve. For example, mathy types will notice that the ‘attack’ maneuver in the conflict mechanic is overpowered. There isn’t much reason to choose anything except ‘attack’ over and over again. This kind of problem is persistent across Luke Crane games, and I have as yet to figure out exactly why. However, it’s incredibly easy to fix. Just tweak the ‘defend’ maneuver so it gives a small bonus against ‘attack,’ and you’re golden. There’s only one problem I haven’t been able to solve so easily, and that’s the group size limitations. Mouse Guard is clearly a game that wants you to have at most four players. This makes sense to a degree, since that’s the largest the group in the original comic ever gets to my knowledge. However, if you have five or six players, the game starts to fray at the edges. The conflict system has trouble with more than 4 characters, and it can be difficult finding things for everyone to do. Obviously, large groups can be problematic in any game, but with Mouse Guard it seems a little more pronounced because the system is so fine tuned everywhere else. So far, I’ve dealt with the problem by splitting the party into smaller groups and switching between them often. Mouse Guard still works for larger groups, just not quite as well. As a fanatic GM, it’s always gratifying to see a new game that pushes the envelope. So many systems coming out nowadays are aimed at further polishing something that already exists, rather than any kind of new innovation. Mouse Guard takes an approach to collaborative storytelling that is different than anything done before. Just as importantly, it handles that approach well. The system plays like a dream, and the setting is a great take on the classic “world filled with monsters that want to eat you.” I cannot recommend enough that you give this game a try. 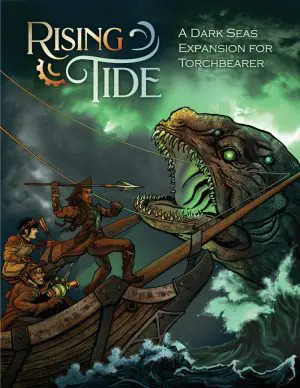 OK, you’ve got me very intrigued by this, but aside from a few tempting examples such as “points on fighter,” I still wonder what it is that makes this RPG different, or how it is easier for the GM. Could you give more specifics or examples? They look for the caravan, I describe the scene and make them roll Pathfinder. They succeed and find the wreckage, weasal tracks, and drag marks from the still living mice taken prisoner. I call for a Hunter roll to follow the weasels. They fail and get ambushed by weasels! Turns out one of the caravan leader was in cahoots the whole time. A Fight breaks out, and we bust out the conflict resolution rules for something with a little more meat to it. Win or lose, the characters are gonna have to deal with that treacherous caravan leader…. Basically, it combines the best part of DND, a world full of monsters that want to eat you, with a system that encourages character oriented roleplaying. It’s Rand again. I just finished playing a session of Mouse Guard (my favorite system) which was really cool. I thought Oren might want to know about it (the two of us liking Mouse Guard and all). The conflict system is so versatile that I managed to run a really neat mystery campaign using it in the best way. Basically I had a conflict where the PC tried to catch the villain using a trap. I used the Scout skill for attack-based moves and Nature for defense. The trap was an item giving a bonus die (like the sword). Their dispositions were reduced at the same time so that the murderer (because the whole thing revolved along a series of murders at another Lockhaven-like area full of rats;the rats being one of my hacks, of course.) managed to get away with another kill, but he was caught. There was an Orator conflict at the end to convince the residents of the area to vote to give the Big Bad the death penalty. It resulted in him going to prison instead. Overall the campaign was really fun! Yessssss! That’s exactly how Mouse Guard should be used. Your PCs tried to give the Big Bad a short drop and a sudden stop, eh? Brutal. Yep. Mouse Guard also does solo adventures really well, because it isn’t a simulation game. You need to check out the new Mistborn adventure game! I looked at it and it’s kind of like Burning Wheel! Hmm… I wouldn’t have picked Mistborn as a great setting for roleplaying, but I’ll check it out. I can’t wait for second ed! One other thing that’s good about Mouse Guard is that you can’t die because a random enemy rolled a lucky number. If the enemy is random, it’s just a single Fighter versus test. Failure means you’re injured. The only way your character can die in a fight is if their enemy is fighting them for a good reason and it requires a full conflict. Have you ever played Freemarket? I want to try it. I own it, but I’ve never played. It looks neat, but maybe a little abstract for my tastes. My epic Mouse Guard campaign: My main character is Kenzie, a female patrol leader mouse. She was sent to investigate Winterhaven, another large stronghold. One of Lockhaven’s mice went missing around that area and she must find him. While inside she discovers a green door, a black door, and a brown door. Above each is a banner with the same color as the door. The green has a mouse on it, the brown has a squirrel, the black has a rat. If you go in the rat, it’s too dark and you would need a rat’s superior low-light vision to navigate successfully. The squirrel shows a mother squirrel in a tree sorting acorns with her children and they uncover a large coin. The mouse door is a happy spring scene outside when a coin drops from the skies and rolls down into a well. They are all parallels. Only rats can navigate the catacombs, squirrels are best at climbing up and out of the tree, and rats get blinded in the mouse door. Squirrels can go in any door but will have a tough time (in this setting they are very adaptable to low-light). Mice and rats are opposed. Squirrels are neutral. That means squirrels go in every door, and any race can go in the squirrel door. However each race is best for its own door. There is a secret item in each door. A skull for rat, a special acorn for squirrel, and a special leaf for mouse. There are green, brown, and black books. Only mice can read the green script, unless a squirrel learns it. The script cannot be learned by rats because it is a secret to them. The green book is missing from all known archives. It is hidden and sought after by the villain, a squirrel who is actually being directed by a much larger force, a weasel. The brown book is written in a squirrel script, while the black is written in rat. The villain is trying to collect all the items, all the books, and have one of each race (the missing guardmouse is being used in this ritual). Then he will head through a hidden weasel door and use all of them to unite the mouse and rat sides. When it happens he will gain all the races abilities. He will learn all their secrets through the books, then use everyone in the Territories as a pawn, destroying them from the inside. The weasel is going to go against him and lure him into a trap. The weasels are trying to use a bear to their advantages and launch an attack on Winterhaven at the same time. Then they will access all of their historical archives which contain the secrets of the ancient opposition between mice and rats. This attack by the weasels is happening at the same time as the rest of it. This is all still developing in my head, however. Now I realize that with a bear in the mix, and the odds pretty much against the mice, it may result in an unhappy ending. Kenzie and her patrolmice may have to rebel against the villains to win back the Territories. So, what do you think? Does Mouse Guard work for my system? Yeah, you could do that with Mouse Guard. Probably the biggest issue is that statting squirrels and rats might be a challenge, as they’re so much larger than mice. Just another bad story game, pretending to be a rpg.